A range of cast roof and floor drains to suit almost any application from pedestrian areas to flat roofs for both internal and external environments in any commercial or industrial project. To learn more about ACO’s cast roof and floor drains visit ACO Wexel. A range of premium stainless steel floor wastes to be used in commercial and industrial projects where hygiene, durability and performance requirements are paramount. 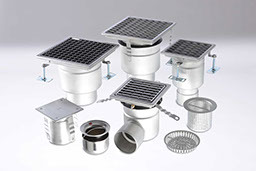 Products are available in a choice of stainless steel grates, bucket traps for trade waste applications and internal foul air traps for where construction height is limited. To learn more about ACO’s stainless steel floor wastes, gullies and bucket traps, visit ACO Gully®. A range of standard and custom industrial stainless steel linear drainage systems, which are available with a wide range of grates or with a continuous inlet. Solutions can be supplied to suit light to heavy duty applications. 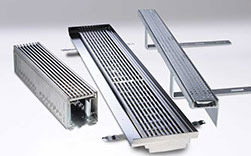 To learn more about ACO’s channel and grate linear stainless steel drains, visit ACO Stainless. 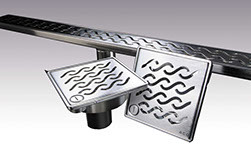 A range of uniquely designed hygienic stainless steel channels and slip resistant grates developed to stringent industry requirements. Deep drawn components, with large radii ensure ease of cleaning and the prevention of harmful bacteria. To learn more about hygienic stainless steel drains, visit ACO Food. A designer range of linear and point drains for bathrooms. A choice of floor grates is available for use in the shower area (ShowerPoint) or bathroom floor (CentrePoint). These can be used alongside ShowerChannel to complete a threefold integrated design. A range of channel and grate drainage products designed to protect the building from stormwater at or around the building line from the ground level up to the roofline. These specialty products intercept and collect surface water specifically for thresholds, balconies, green roofs and building façades. To learn more about ACO’s threshold, balcony and green roof drains, visit ACO BuildLine. A range of high performance grease traps compliant to Australian water authority requirements. These products have been developed specifically for hotels, restaurants and food processing areas to combat built up fats, oils and grease (FOGs) in the plumbing and sewer system. 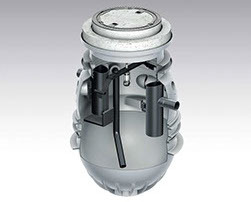 To learn more about ACO’s grease traps, visit ACO Passavant. 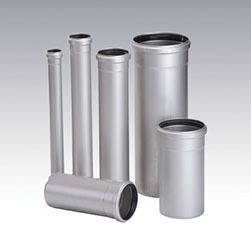 A complete system of modular stainless steel push fit socketed pipes to provide a metal alternative to PVC and HDPE soil and waste pipework. Manufactured from grade 316 austenitic stainless steel, all modular products are chemically pickled and passivated for optimum durability and corrosion resistance. To learn more about the ACO’s stainless steel drainage pipe system, visit ACO Pipe®.